An important tribe of the Muscogean family, this tribe formerly occupied the middle and south Mississippi River with their territory extending as far east as Florida in their most flourishing days. They trace their roots to a mound-building, maize-based society that flourished in the Mississippi River Valley for more than a thousand years before European contact. The Choctaw were preeminently the agriculturists of the southern Indians. They were known for their rapid incorporation of white customs, developed a written language, and welcomed European-Americans and African-Americans into their society, leading them to become known as one of the Five Civilized Tribes . The earliest notice of these Indians is found in the Hernando de Soto’s narratives in 1540. Though this encounter would end in a bloody battle, as the brutalities of the expedition became known, the Choctaw would come to embrace European traders nearly two centuries later. When the French, in the beginning of the 18th century, began to settle colonies at Mobile, Alabama; Biloxi, Mississippi; and New Orleans, Louisiana, they befriended the Choctaw, who became their allies in wars against other Indian tribes. Though the Choctaw were closely related to the Chickasaw tribe in language and customs, they were constantly at war with them. Later, English traders succeeded in drawing over to the English interest, some of the eastern Choctaw towns, which brought on a war within the Choctaw, with those who were still loyal to the French. This animosity continued until the French and Indian War was over in 1763. After the French had surrendered their American possessions to Great Britain, and to some extent previously thereto, members of the tribe began to move across the Mississippi River. 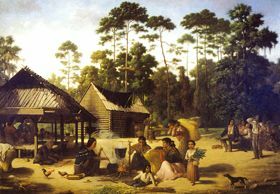 During the American Revolution, most Choctaw supported the Thirteen Colonies’ bid for independence from the British Crown. By the time President George Washington initiated a program to integrate Southeastern Indians into European American culture following the American Revolution, many Choctaw had already intermarried, converted to Christianity and adopted other white customs. Over the next several years, the Choctaw would enter into nine treaties with the U.S. Government, the last three of which were designed to move the Choctaw west of the Mississippi River. During the Indian Removal Period, President Andrew Jackson made the Choctaw exile a model of Indian removal. 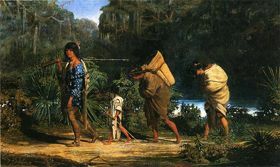 In 1831, nearly 17,000 Choctaw became the first Native Americans to walk the Trail of Tears to Indian Territory (Oklahoma.) Nearly 2,500 members perished along the way. 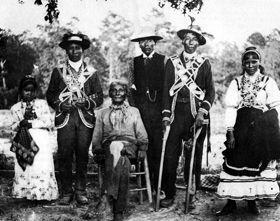 The last treaty; however, also provided that Choctaw members could choose to stay in Mississippi and become U.S. Citizens, subject to the laws of the country and the state. Approximately 5,000-6,000 chose to remain, but would suffer legal conflict, harassment, and intimidation at the hands of the white settlers. The Choctaw in Mississippi were later reformed as the Mississippi Band of Choctaw Indians and the removed Choctaw became the Choctaw Nation of Oklahoma. Despite the many lives lost on the Trail of Tears, the Oklahoma Choctaw remained a hopeful and generous people. The first order of business upon arriving in their new homeland was to start a school and a church and drafted a new constitution. During the Civil War, the Choctaw in both Oklahoma and Mississippi mostly sided with the Confederate States of America. At the beginning of the war, Albert Pike was appointed as the Confederate envoy to Native Americans. In this capacity he negotiated several treaties, including the Treaty with Choctaw and Chickasaw in July 1861. Some Choctaw identified with the Southern cause and a few owned slaves. In addition, they well remembered and resented the Indian removals from thirty years earlier and poor service they received from the federal government. However, the main reason the Choctaw Nation agreed to sign the treaty, was for protection from regional tribes. Soon Confederate battalions were formed in Indian Territory and later in Mississippi in support of the southern cause. After the Civil War, the Mississippi Choctaw were largely ignored by the government and fell into obscurity, though they continued to practice their culture as they had for generations. In the meantime, the Choctaw in Oklahoma struggled to maintain their nation, as land cessions were required by the Five Civilized Tribes, who had supported the Confederacy. They were also required to free their slaves and make them citizens. Called Choctaw Freedmen, considerable debates occurred over the next several years, but they were finally granted Choctaw Nation citizenship in 1885. In 1889, the government used its railroad access to the Oklahoma Territory to stimulate development there and opened two million acres for settlement, resulting in the Land Run of 1889. The Choctaw Nation was overwhelmed with new settlers and could not regulate their activities, suffering from violent crimes, murders, thefts and assaults from new settlers and other tribal members. The struggle over land with the U.S. Government continued and soon the Dawes Commission was established to end the tribal lands held in common, and allot acreage to tribal members individually and dissolve the governments of the Five Civilized Tribes. Though the nations fought hard against this, the governments were dissolved in 1906 and the following year, Oklahoma was admitted as the 46th state. In World War I, the Choctaw served in the U.S. military as the first Native American code talkers, using the Choctaw language as a natural code. Tribal members also served in World War II, after which the nation began efforts to reestablish itself. For the next two decades they worked hard to attract and develop new businesses and fight legislation to eliminate Native American rights of sovereignty. The Choctaw Nation of Oklahoma was scheduled for termination when Congress repealed the law in 1970, citing the policy’s documented failure in helping Native Americans. The repeal set the Choctaw in a new direction and in 1971, the nation held its first popular election of a chief since Oklahoma achieved statehood in 1907. They also established a tribal newspaper, began to enroll more members, and launched a movement to preserve the Choctaw language. Before long, a new Constitution was ratified which provided for an executive, legislative and judicial branch of the government. The population of the tribe when it first came into relations with the French, about the year 1700, was estimated from 15,000 to 20,000. Their number in 1894 was 18,981 citizens of the Choctaw Nation, 1,639 Mississippi Choctaw, and 5,994 Freedmen. Today, they number nearly 200,000 strong. They operate business ventures, both in Mississippi and Oklahoma, in Gaming, Electronics, and Hospitality industries, while continuing to practice their language and cultural traditions. 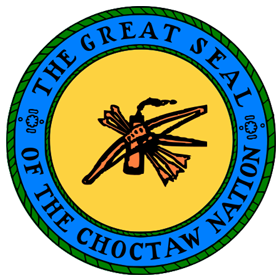 The Choctaw Nation of Oklahoma and the Mississippi Band of Choctaw Indians are the two primary Choctaw associations today, although smaller Choctaw groups are also located in Alabama, Louisiana, and Texas.